We have learnt how to draw graph for an equation of type y=mx+c(Where m is a constant). We have also observed that the equation of this type represents a straight line. Note that y = =bx-c is an equation to a line. Problem 7.5.1 illustrates this method. 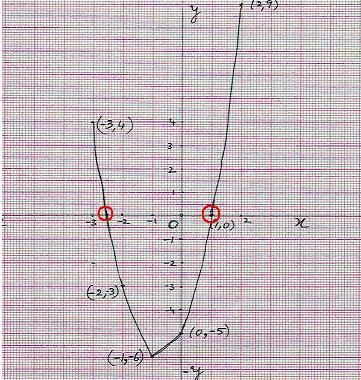 Draw the graph ax2 +bx+ c and then find the points on the graph which touches x-axis (I.e. when y=0).The x-co-ordinates of the points on the graph, whose y-co-ordinates are zero, are roots of the given equation. Problem 7.5.2 illustrates this method. Why did we ask you to find coordinates for only 2 values of x? Step 4: On a graph sheet mark these two (x,y) co-ordinates. Join these two points. The parabola and the straight line cut each other at two points. They are (-1, 2) and (1.5, 4.5). Their x co-ordinates are -1 and 1.5 respectively. -1 and 3/2 satisfy the given equation 2x2-x-3=0. - They are all symmetric about y-axis. - They are all symmetric about x- axis. 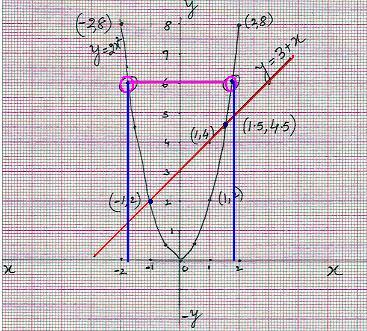 Step 2: On a graph sheet mark these (x, y) co-ordinates. Join these points by a smooth curve. This smooth curve is a parabola. x= -2.5(= -5/2) and at x=1. Therefore 1 and -5/2 are the roots of the given equation. The graph touches x axis at 2 points and thus has two roots. The graphs do not meet at all! The graph does not touch x axis and thus no roots.